Academic sessions at Steel City Squash focus on homework completion and skill development. Staff visit schools and meet with teachers to stay abreast of current assignments and projects, upcoming tests and deadlines, and overall student development. 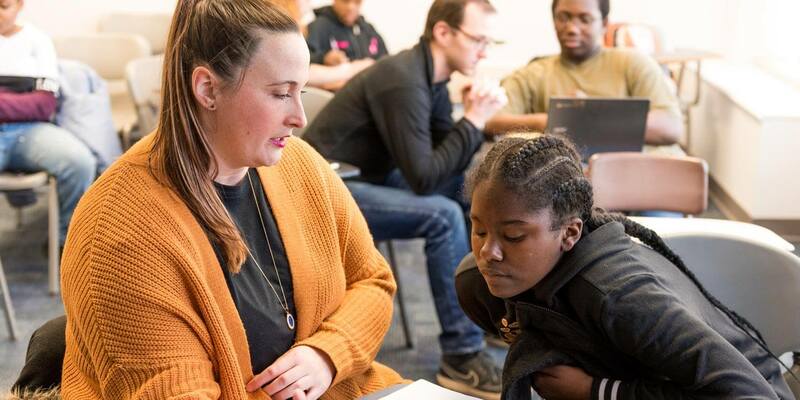 During our after-school program, staff and volunteers work one-on-one with students to ensure that each student not only completes homework but does so accurately and with a complete understanding. While homework completion and mastery is our primary goal, we also supplement our students learning with a dynamic literacy and STEM based enrichment curriculum. Utilizing all of Pittsburgh’s available assets, staff creates engaging projects for students to submit to national competitions. In the pasts, Steel City Squash students have been recognized as runners up and winners in competitions for art, science and writing competitons. Partner programs include: Reading is Fundamental, ASSET STEM Education, Carnegie Mellon University, Kids Cook, The Warhol Museum, and many others. The After School program is an intensive, year-round model where students are expected to attend and participate in at least two practice and academic tutoring sessions per week, Monday through Thursday; two Fridays per month; and at least one Saturday session per month. Student-athletes spend their summer months honing their academic and squash skills. Students participate in literacy, math and STEM curriculum, practice squash daily, and go on field trips. Middle School students also participate in Pitt’s Kids Summer Camp, hosted by the University of Pittsburgh, where they have swim lessons, taekwondo and rock-climbing on Pitt’s indoor climbing wall.